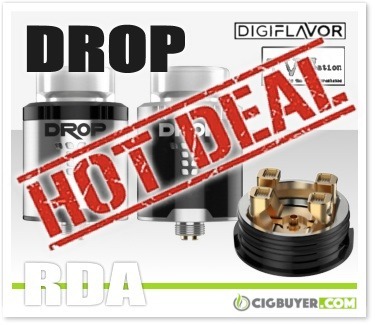 Digiflavor Drop RDA Deal – ONLY $15.99! If you’ve been thinking about grabbing the Digiflavor Drop from TVC, here’s an unbeatable deal from US vendor Volcano Cigs. While supplies last you can get one for only $15.99! Designed by Youtube reviewer The Vapor Chronicles (TVC), the 24mm Digiflavor Drop RDA features a unique 4-terminal deck that allows for easy coil placement and maximum build space. It can accommodate single, dual, triple or even quads coils and offers a spacious juice well with a unique stepped airflow design for smooth, leak-free operation. Choose from two 810 drip tips or 510 adapter. A bottom-feeding squonk pin is also included.